The L-type calcium channel, Cav1.2, plays a central role in regulating an activity-dependent signaling network that is essential for neuronal function -. A particularly salient example of a perturbation in Cav1.2 function is Timothy syndrome (TS), a rare genetic disorder caused by dominant mutations in the gene CACNA1C, which encodes the α subunit of the voltage-gated calcium channel Cav1.2. TS mutations in this subunit result in a conformational change of Cav1.2, leading to delayed channel inactivation and elevation of intracellular calcium upon depolarization -. TS patients typically exhibit a spectrum of severe nervous system abnormalities, including autism spectrum disorder (ASD) in up to 80% of the patients -. Given the increasing appreciation for rare monogenic contributions to ASD -, TS provides a powerful avenue for understanding both basic neurobiological processes and ASD pathophysiology. Given the pleiotropic manifestation of CACNA1C mutations in TS and the recent implication of common variation in CACNA1C across multiple neuropsychiatric disorders , we reasoned that characterization of the Cav1.2-dependent signaling network in TS would help elucidate its molecular basis and prioritize genes for therapeutic development. Although it has been known that calcium influx triggers massive transcriptional changes by acting through several transcription factors, including calcium response factor (CaRF) ,, myocyte enhancer factor-2 (MEF2) ,, nuclear factor of activated T-cells (NFAT) ,, and cAMP response element-binding proteins (CREB) -, little is known about their downstream targets in human neurons and how these processes are altered in disease states such as TS. Here, we reasoned that identifying alterations in mRNA transcript levels in TS patient-derived cortical progenitors and developing neurons would help clarify, not only how calcium regulates gene expression in TS, but more broadly inform our understanding of the molecular mechanism of ASD. Previously, we reported that the TS mutation was associated with abnormalities in cortical neurogenesis, activity-dependent dendrite retraction, and an excess production of catecholamines ,. Here, to provide a higher order view of the transcriptional changes caused by the TS mutation in CACNA1C, we constructed genome-wide transcriptome networks in control and TS neural progenitors and differentiated neurons at rest and following depolarization. Using Weighted Gene Co-expression Network Analysis (WGCNA) ,, we identified gene co-expression modules associated with neural development, as well as depolarization shared across both patient and control lines. 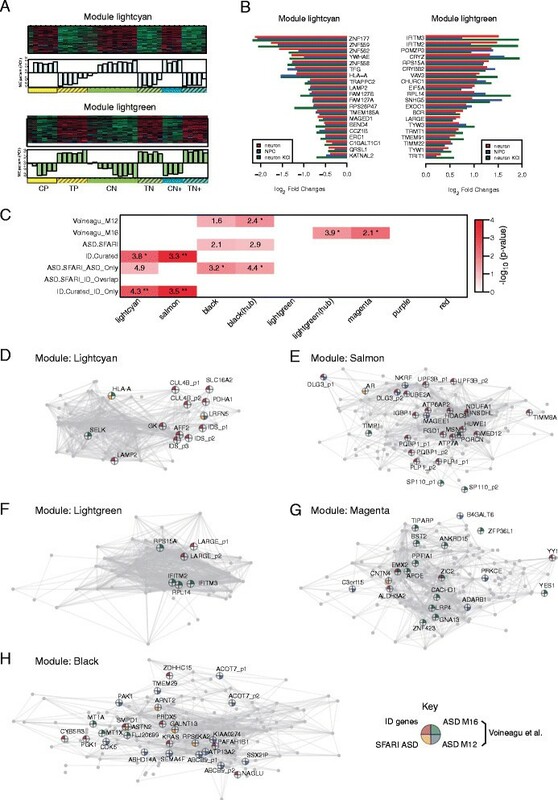 By comparing TS and control networks, we identified distinct TS related modules enriched in intellectual disability (ID) genes and ASD susceptibility genes. By further integrating the co-expression network with transcription factor binding analysis, we identified candidate regulators for disease-associated modules, including NFAT ,, MEF2 ,, CREB -, and forkhead box proteins O (FOXO) -. Our results provide a functional genomic framework for a calcium-dependent signaling network by highlighting the downstream transcriptional targets of Cav1.2 dysregulation, and yields insights into molecular mechanisms relevant to both TS and ASD. We conducted signed co-expression network analysis using the R WGCNA package  as previously described -. WGCNA is based on topological overlap measurements derived from pairwise correlation-based adjacency values to estimate the neighborhood similarity among genes, followed by hierarchical clustering to identify gene co-expression modules. Instead of focusing on individual genes, WGCNA is highly effective for characterizing the features of co-expressed gene modules , each of which is represented by a color classifier. Here, the correlation values were raised by a power of 12 to satisfy scale-free criteria . The minimum module size was set to 40 genes and the height for merging modules was set to 0.25, which required at least 25% dissimilarity among modules in expression. We identified a total of 18 modules (Additional file 1: Table S1), each summarized by its eigengene (ME, defined as the first principal component of the standardized expression values ). The significance of module eigengene-phenotype association (cell type, mutation status, and resting vs. depolarization) was evaluated by a linear regression model using the R lm function. Associations with FDR (Benjamini-Hochberg (BH) correction ) less than 0.05 was considered as significant. Genes were prioritized based on their correlation with the module eigengene (kME) . The top connected genes (either kME >0.6 or the top 200, depending on which was smaller to facilitate visualization) were used to generate the module network plots via the R igraph package . We first assessed the preservation of modules identified in combined case and control samples in two independent data sets: (1) expression profiles of differentiating primary human neural progenitor cells in vitro over 12 weeks (phNPCs) (GSE57595) , and (2) expression data from developing human cortex (post conception week 4 through 6 months after birth) from Kang et al. (GSE25219) ,. A one-sided Fisher exact test was performed to assess over-representation of module genes in other gene sets using the R function fisher.test. Depolarization-associated gene lists were curated from two publications (McKee et al. and Kim et al. ). The ASD susceptibility genes were curated from the SFARI gene database . Genes categorized as Syndromic (S) and those with associated scores in the range of 1 to 4 were used in our analysis. The ASD-associated co-expression modules asdM12 and asdM16 were obtained from Voineagu et al. . The ID-associated genes were curated from four reviews - resulting in 401 genes as reported in Parikshak et al. .
TFBS enrichment analysis was conducted by scanning the promoter sequence of the genes in the analyzed modules for enrichment of known transcription factor binding motifs using the Clover algorithm . For every gene, we considered 1,000 bp upstream of its transcription start site as the candidate promoter region. The putative binding motifs were obtained from TRANSFAC , in the format of position weight matrix. To comprehensively evaluate the statistical significance of the enrichment results, we utilized three different background datasets: 1,000 bp sequences upstream of all human genes, human CpG islands and the sequences of human chromosome 20. We calculated the enrichment P values from the null distribution generated by repeatedly drawing 1,000 random sequences of the same length from the background sequences. Significant events were defined at P <0.05 across all three backgrounds. To confirm the validity of the predicted motif enrichment, we determined if existing chromatin immunoprecipitation (ChIP) data for transcription factors supported the predicted binding sites. The ChIP data sets were obtained from ENCODE , and ChIP Enrichment Analysis resource (ChEA) . We reported the number of predicted binding targets that could be verified by corresponding transcription factor ChIP data from any tissues or cell lines where available. Statistical significance was evaluated by assessing the cumulative hypergeometric probability using phyper function in R. The population size was defined as the total number of genes expressed in this data set. WGCNA identifies co-expression modules associated with neuronal differentiation and depolarization. (A) Flowchart illustrating the experimental procedures and expression analysis. (B) Hierarchical clustering of genes based on gene co-expression pattern across progenitors, neurons at rest, and after depolarization. Identified co-expression modules were represented by color classifiers, noted across the top of the dendrogram. The `differentiation’, `depolarization’, and the `TSmutation’ color bars represent the correlation values between gene expression and three biological traits: differentiation, depolarization, and CACNA1C G406R mutation status, respectively. Red signifies upregulation, while blue signifies downregulation. Only the genes with a trait correlation larger than 0.5 or smaller than -0.5 are marked in the plot. (C-I) Module eigengene patterns and enrichment scores of the top five enriched GO categories for module (C) turquoise, (D) blue, (E) brown, (F) tan, (G) yellow, (H) midnightblue, and (I) green. Samples are ordered by control progenitors (CP), patient progenitors (TP), control resting neurons (CN), patient resting neurons (TP), control depolarized neurons (CN+), and patient depolarized neurons, as illustrated by the key at the bottom. (J) Module-level enrichment for previously identified differentiation- and depolarization-associated gene sets curated from: (1) Kang et al. developing postmortem human brain ,; (2) Stein et al. phNPC expression study (phNPC_wk1vswk8_up/down) ; (3) McKee et al. ; and (4) Kim et al. KCl-induced depolarization expression studies. `brain_s1vss8_up/down’ represent the genes that are either up- or downregulated between stage 1 vs. stage 8, while `phNPC_wk1vswk8_up/down’ are the group of the genes up- or downregulated between week 1 vs. week 8 differentiation, as defined in the paper ,. Cells are colored to reflect enrichment significance with ceiling of 10-4. Enrichment odds ratios are shown in the table if the P <0.05 (*FDR <0.05). We next assessed the reproducibility and generalizability of the network structure. We used module preservation analysis  to compare the identified modules with independent expression profiles from in vivo human brain development and in vitro neuronal differentiation of primary human neural progenitor cells (phNPCs) (Methods). Remarkably, the co-expression structure of 10 modules can be reproducibly identified in either of two independent expression datasets, differentiating phNPCs in vitro or in vivo cortical development from post-conception week (PCW) 4 to 6 months after birth (Table 1; Additional file 2: Figure S1) ,. Given the biological (different cells and tissues) and methodological differences (different RNA preparation and microarrays) between these studies, the correspondence with previous in vivo and in vitro expression data provides important validation of the transcriptional networks we identified in iPSC-derived neural cells. The top five connected genes ranked by kME and the top three enriched GO terms are listed for each module. Modules are labeled if they were preserved in independent in vivo and in vitro expression data sets , according to module preservation analysis  (Methods). We first sought to investigate if the identified co-expression networks recapitulate molecular processes related to neuronal differentiation and neuronal depolarization in general. We used the module eigengene (first principal component of the expression pattern of the corresponding module ,) to summarize gene expression trajectories across samples, and evaluated the relationship of the 18 module eigengenes with differentiation and depolarization status. We found 10 modules strongly correlated with neuronal differentiation and nine modules significantly associated with KCl-induced neuronal depolarization (FDR <0.05), observed in both case and control cell lines (Table 1; Additional file 2: Figure S2). Representative examples with module eigengene trajectories and enriched GO terms are shown in Figure 1. Importantly, as highlighted above, we found that many of differentiation and depolarization associated modules were present in independent in vivo and in vitro expression data sets (Table 1), providing independent validation for these in vitro iPSC-derived networks. For instance, as compared to in vivo human fetal brain transcriptional networks, the modules corresponding to iPSC-derived cortical neurons faithfully recapitulated biological processes driving in vivo cortical development, including neurogenesis and differentiation (blue and yellow modules), axonogenesis and dendrite growth (turquoise), as well as synaptogenesis (turquoise and green yellow modules) (Figure 1; Table 1; Additional file 2: Figure S3) ,. Additionally, the genes within depolarization-associated modules (brown, tan, green yellow, and midnight blue modules) demonstrated significant overlap with previously defined depolarization-associated gene sets defined in mouse cortical neurons  and human neuroblastoma cells (IMR-32)  before and after KCl treatment (Figure 1J). In particular, the two modules downregulated upon depolarization (brown and tan) were enriched for GO categories related to mitochondria, suggesting altered energy consumption upon prolonged neuron depolarization, in agreement with McKee et al. in human neuroblastoma IMR-32 cells . Together these findings demonstrate the power of WGCNA in identifying generalizable, functionally important gene modules. Interestingly, a subset of modules was enriched for genes affected by both differentiation and depolarization (Figure 1J; Additional file 3: Table S2), which could provide a molecular basis for modulation of neuronal differentiation by depolarization -. For instance, the brown module, whose module eigengene showed dramatic down-regulation in depolarized neurons, also followed a significant decrease with neuronal differentiation (Figure 1E). On the other hand, the module eigengenes of the yellow, tan, black, and midnight blue modules, showed opposite directions upon differentiation as compared with depolarization (Figure 1F-H). These observations were consistent with the notion that neuronal plasticity can recapitulate processes involved in neuronal development -. Gene co-expression modules associated with the TS mutation. (A) Heatmap showing expression pattern of the module genes and a barplot showing the module eigengene pattern across samples for the light cyan and light green modules. (B) Log2 transformed fold changes of the top 20 connected genes in the light cyan and light green modules in cases as compared to controls at the three experimental stages. (C) Module-level enrichment for previously identified ASD and ID associated genes. Enrichment odds ratios are shown in the table if the P <0.1 (*P <0.05, **FDR <0.05). (D-H) Visualization of the co-expression network among the top connected genes (kME >0.6 or top 200 depending on which one is smaller) based on multidimensional scaling of their pairwise co-expression correlations in the (D) light cyan, (E) salmon, (F) light green, (G) magenta, and (H) black module. Genes with multiple probes are labeled separately. Pie chart: ID susceptibility genes (red); ASD susceptibility genes from the SFARI database (yellow) ; genes in the Voineagu et al. asdM12 module (purple) ; genes in the Voineagu et al. asdM16 module (green) . Only the top 1,000 connections are shown in each module. A further critical question is: to what extent these TS-associated modules can inform us about the molecular mechanism of TS-related abnormalities? Here, we investigated every module by GO/KEGG enrichment analysis and performed over-representation analysis with respect to curated disease associated genes (Methods). We observed striking enrichment of known ID susceptibility genes - in two downregulated modules, light cyan and salmon (Figure 2C; Additional file 3: Table S3). Specifically, in the light cyan module, seven ID genes were identified: LAMP2, GK, IDS, CUL4B, AFF2, PDHA1, and SLC16A2 (Fisher’s exact test: enrichment odds ratio (OR) = 3.8; P = 0.004). More importantly, these seven ID candidate genes form a sub-cluster within the light cyan module (Figure 2D), suggesting their tight functional dependence. Moreover, this module was enriched for GO categories involved in organelle membrane, and the KEGG pathway of ubiquitin mediated proteolysis, which agrees with previous reports of the causal relationship between impaired proteasomal activity and cognitive disorders, including ID . The salmon module, which contained genes downregulated in cells carrying the TS mutation, was even more enriched for ID susceptibility genes, containing 18 genes known to cause ID (OR = 3.3, P = 3e-05) (Figure 2E). Together the identification of these two downregulated modules provides an unbiased starting point based on gene expression for exploring the molecular connections between the TS mutation and the molecular mechanisms of ID . We next evaluated the upregulated modules in TS neurons. As shown in Figure 2C, the light green and magenta modules show significant overlap with asdM16, a module of genes upregulated in ASD postmortem brain  (Additional file 3: Table S5). The biological functions enriched in this module include immune response, which is consistent with immune dysfunction observed in TS ,,. In particular, 18 genes in the ASD postmortem asdM16 module were identified in the magenta module, and four were identified in the light green module (Figure 2F-G). Remarkably, IFITM2 and IFITM3, two interferon response genes that have been shown to be the hub genes in asdM16 , were also identified as hubs in this light green module, showing parallel dysregulation in ASD and TS patients. In the light green module, we also identified INPP5E, a gene involved in phosphatidylinositol signaling system and known to mobilize intracellular calcium. Mutation of this gene leads to Joubert syndrome, which is a rare monogenic condition with high penetrance for ASD -. In summary, both down- and upregulated modules in TS show changes parallel with those observed in postmortem brain of idiopathic ASD, consistent with the existence of convergent molecular pathways in multiple forms of ASD . Differentiation defects in TS cortical neural progenitors. (A) Heatmap showing gene expression patterns in the black module and a barplot showing the corresponding module eigengene trajectory. (B) Boxplot comparing the module eigengene patterns between case cells vs. control cells at three experimental stages. (C) Barplot showing the log2 fold changes of the top 20 connected genes in the black module upon differentiation. Blue bars show the log2 fold changes in control samples, and pink bars represent the log2 fold changes in patient samples. (D) Differentiation-dependent gene expression changes in the patient progenitors. The differentiation-associated genes are categorized into four groups: (1) genes downregulated upon differentiation in controls but not in patients (top left); (2) genes that are upregulated upon differentiation in controls but not in patients (top right); (3) genes downregulated upon differentiation in patient cells but not in controls (bottom left); and (4) genes upregulated upon differentiation in patient cells but not in controls (bottom right). The log2 fold changes of the top 15 genes that show largest difference between cases and controls are shown in each group. The top enriched GO categories and KEGG pathways identified in each of the four gene groups are shown in the corresponding tables with enrichment P value attached. As shown in Paşca et al., increased [Ca2+]i elevations were observed in TS-derived neural progenitors and neurons after depolarization . Thus we investigated how the identified TS-associated expression features could be related back to the causal TS calcium channel mutation and corresponding changes in [Ca2+]i signaling. It is known that calcium influx regulates activity-dependent gene expression through a hierarchical transcription network acting through multiple signaling cascades ,. While simple lists of up- and downregulated genes may not provide power to identify regulatory mechanisms, we hypothesized that these tight co-expression modules would reflect calcium-dependent co-regulation. To test this, we performed transcription factor binding site (TFBS) motif enrichment analysis on the seven TS associated modules to investigate whether those modules were enriched for any calcium-dependent transcriptional regulators (Methods). For each module, we identified a set of transcription factor binding sites enriched within a 1 kb window upstream of the transcription start site, providing strong evidence for the co-regulation hypothesis. Moreover, this TFBS analysis identified four important calcium-regulated transcription factor families in the TS related modules: NFAT ,, MEF2 ,, CREB -, and FOXO -. Among them, FOXO proteins, which regulate neuronal polarization and positioning  and synaptic function and memory consolidation , have binding targets enriched in six out of seven TS-associated modules (light cyan, salmon, magenta, black, purple, and red) (Figure 4). A total of 1,249 predicted targets were identified in these six modules, and 229 of them were validated through data from chromatin immunoprecipitation (ChIP) experiments -, providing a significant validation of the bio-informatic predictions (hypergeometric test; P = 7.73E-12; Methods). Timothy syndrome-associated modules are regulated by known calcium-dependent transcription factors. The TS-associated modules are enriched for targets regulated by known calcium-dependent transcription factors, MEF2, NFAT, CREB, and FOXO, which are listed in the middle of the figure. Dashed lines indicate significant enrichment of the designated transcription factor binding targets (P <0.05) in the corresponding modules (blue lines indicate P <0.01). The top 20 connected genes in each module are plotted according to the multidimensional scaling of their pairwise co-expression correlations, so that co-expressed genes are clustered to each other. Genes are connected if their pairwise correlations are higher than 0.7. Pie chart: ChIP-seq verified FOXO targets (blue); ChIP-seq verified NFAT targets (red); ChIP-seq verified CREB targets (green); ChIP-seq verified MEF2 targets (yellow). Genes with multiple probes are labeled separately. The other TF enrichments were limited to smaller subsets of modules. Perhaps most remarkable is the enrichment of NFAT targets in two modules upregulated in TS, magenta and light green (also asdM16 associated, which is upregulated in idiopathic ASD ; Figure 4). Four of the five members in this protein family, NFATc1, NFATc2, NFATc3, and NFATc4, are known to be regulated via calcium signaling ,,,. Forty-two genes (68%) in the light green module and 262 genes (82%) in the magenta module were predicted to contain at least one NFAT binding site in their promoter regions. No ChIP data are available from developing neurons, but in lymphoblasts ,, we were able to observe direct binding to 25 neuronal targets (hypergeometric test; P = 2.02E-2). Taken together, these results suggest that the two upregulated modules (light green and magenta), which also represent the convergence of TS and ASD at the level of gene expression, are likely to be mediated via the calcium/NFAT signaling pathway. MEF2, a well-studied calcium or neuronal activity dependent transcription factor family number ,,, was enriched in the promoter regions within genes contained in four TS associated modules: black (downregulated in TS and with activity, asdM12 associated), magenta (upregulated in TS, asdM16 associated), purple, and red (Figure 4). Of the four different MEF2 family members, MEF2A, MEF2B, MEF2C, and MEF2D, three (MEF2A/C/D) had their binding sites enriched in all four modules. Specifically, 309 genes (76.5%) in the black module, 246 genes (77%) in the magenta module, 214 genes (75%) in the purple module, and 354 genes (77%) in the red module contain at least one MEF2 binding site. Using experimental ChIP-seq and ChIP-chip data -, we were able to validate a total of 358 predicted MEF2 binding targets (hypergeometric test; P = 6.58E-20) (Methods). Remarkably, MEF2A and MEF2C were previously reported to have binding sites enriched in idiopathic ASD associated co-expression modules, consistent with the notion of involvement of activity-dependent dysregulation in idiopathic ASD pathogenesis ,. Targets of two CREB proteins, CREB1 and CREB2, were also enriched in the black (downregulated in TS and with activity, asdM12 associated), and magenta (upregulated in TS, asdM16 associated) modules (Figure 4). CREB transcription factors bind to the cAMP-responsive element (CRE), and are regulated by calcium influx ,-,. One hundred and sixty-one (40%) genes in the black module and 134 genes (42%) in the magenta module were predicted to have at least one CREB binding site, 164 of which could be validated through available ChIP experiments - (hypergeometric test; P = 4.15E-63) (Methods). 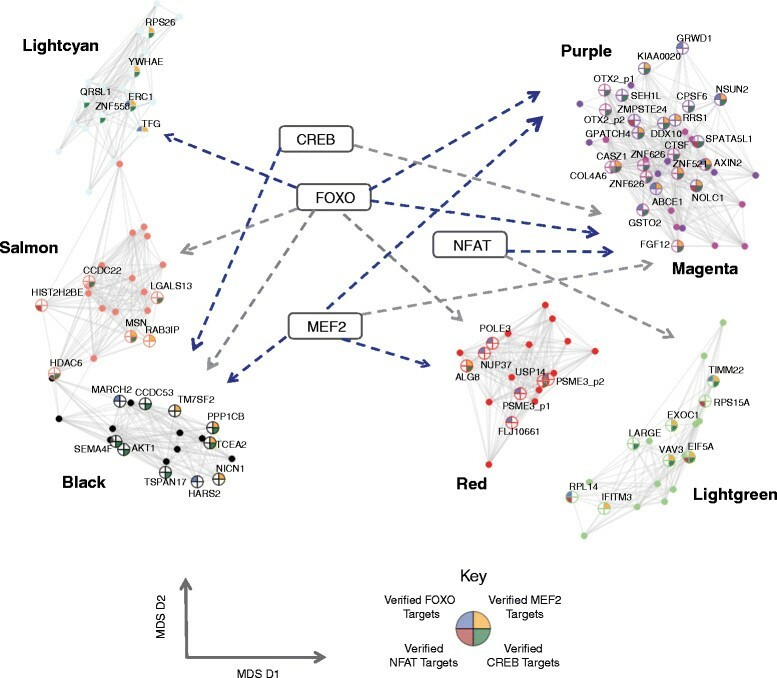 Moreover, we observed overlap of the predicted targets between the CREB-transcriptional machinery and the MEF2 proteins (Additional file 2: Figure S4), although their binding motifs are quite different. One hundred and forty-eight genes have at least one predicted binding site for both MEF2 and CREB proteins in the black module and 123 (39%) in the magenta module, respectively, strongly implicating a synergistic interaction between the two pathways upon calcium influx. As with other single gene disorders, how a mutation in a single gene yields such pleotropic CNS phenotypes provides a significant challenge . 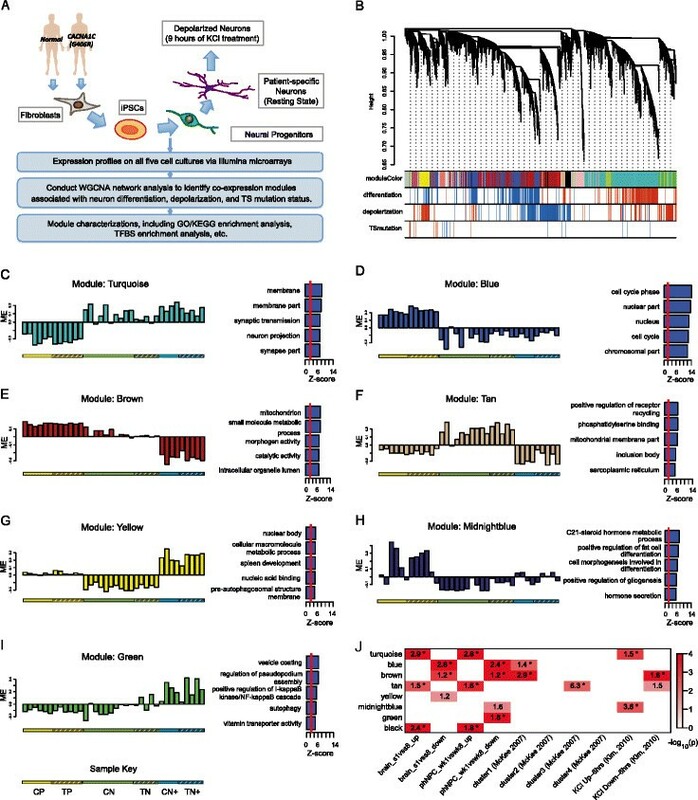 Here, our bio-informatic analysis links specific molecular pathways perturbed in TS neurons to different aspects of TS, including ID, alterations in immune response, and behavioral phenotypes overlapping with ASD -. 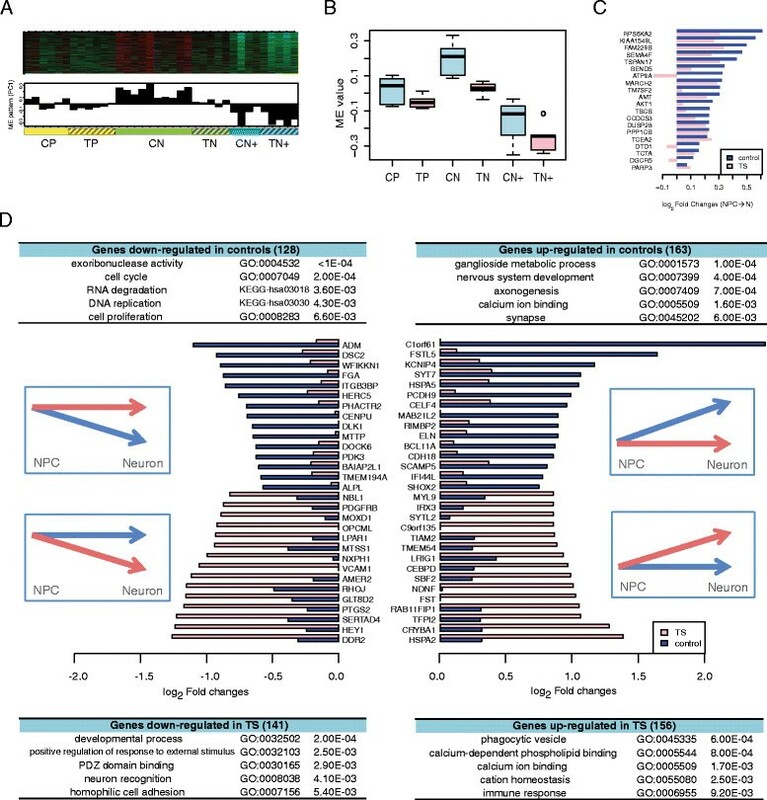 The identification of modules highly enriched for genes that either cause or increase risk for ID and ASD, provides new avenues to investigate the pathways that may mediate divergence between these disorders . In particular, the enrichment for genes that were dysregulated in idiopathic ASD brain (asdM12 and asdM16)  demonstrates the existence of previously suggested convergent molecular pathways in idiopathic ASD in this monogenic highly penetrant form of ASD -. In parallel with recent findings, our analysis also indicates distinct modules associated with ASD (black, light green, and magenta) and ID (light cyan, salmon), consistent with divergent molecular mechanisms for ASD and ID . Our analysis also prioritizes important gene sets (module hub genes) and pathways for further analyses. These genes can be helpful to understand how diverse genetic syndromes converge on ASD and how they are modulated. For example, two interferon response genes, IFITM2 and IFITM3, that are dysregulated in ASD brains  and the light green module in TS, as well as RPS6KA2 and AKT1 in the black module, highlight potential convergent molecular links between TS and ASD that warrant future experimental investigation. Network analysis allowed us to determine disease-associated alterations at the level of transcriptional co-regulation. TFBS enrichment analysis prioritized several candidate transcription factors as putative regulators of disease-associated modules, most of which could be confirmed by experimental data. These findings provide direct evidence for our hypothesis that module gene co-regulation reflects transcription factor binding. More importantly, our analysis identified four known calcium-dependent gene transcription factor families that regulate key genes within these modules: FOXO -, NFAT ,, MEF2 ,, and CREB -. Moreover, by showing the overlap of the TF targets within modules, our analysis also implicates coordination among those calcium-dependent transcriptional regulation pathways. In particular, we predict a synergistic effect between MEF2 and CREB proteins in TS cells, consistent with the observation that phosphorylation of both MEF2 and CREB proteins leads to recruitment of CREB-binding protein (CBP) to activate downstream transcription . Lastly, since several modules regulated by these calcium-dependent pathways are also associated with ASD, these data support previous suggestions that dysregulation of activity-dependent signaling plays a more general role in ASD pathogenesis . Also, of note, our analysis also highlights the potential role for RSK (ribosomal S6 kinase) proteins as putative regulators of genes in the black module. RSK proteins have been implicated in disorders of cognition and behavior, and mutations in RSK2 lead to Coffin-Lowry syndrome, an X-linked dominant genetic disorder that causes severe mental problems . RPS6KA2 (also known as ribosomal s6 kinase 3, RSK3), RPS6KA4, and AKT1, all kinases that are known to regulate CREB ,-, were identified in the black module, where RPS6KA2 and AKT1 were hub genes. Additionally, several known RSK and AKT substrates were found in the black module, including GSK3A, BEX1, CTNND2, and PAK1, which were centrally located in the protein-protein interaction network of the black module (Additional file 2: Figure S5). These observations lead us to speculate that RSK3/AKT1/CREB have key regulatory roles in the black module, and that downregulation of the black module in TS samples is due to downregulation of RSK/AKT pathways, a hypothesis that can be directly tested through experimental investigation. Neuronal development signaling and plasticity depends on electrical activity ,-. For instance, KCl-mediated depolarization of neurons changes the chromatin accessibility of several differentiation-associated genes, such as NCAM and TH, and can subsequently alter the differentiation path of neurons ,. However, neuronal depolarization has rarely been investigated at the genome-wide scale in human derived neural progenitors and neurons. Here, we identified five modules (brown, tan, yellow, midnight blue, and black) that were highly correlated with both differentiation and depolarization, providing a molecular network connecting these processes. An illustrative example is the black module, which is associated with the TS mutation, and was upregulated upon differentiation and downregulated upon depolarization. Importantly, as implicated by the black module trajectory, TS derived neural progenitors exhibited significant differentiation deficits, strongly implicating the involvement of Cav1.2 in neural development. This is supported by changes in several genes involved in cation homeostasis control, including AGTF1, ANXA7, CD55, HMOX1, SFXN4, SLC11A2, SLC39A14, and SLC4A11, which were exclusively upregulated in TS progenitors upon differentiation, consistent with large-scale changes in the molecular networks associated with differentiation in TS.